It will also only protect you against the suns UVB and UVA rays if it is broadspectrum. The Cancer Council gives some great information about sunscreen, SPF and broad spectrum if you want to explore this topic further. A hat protects you no matter what… so use one. 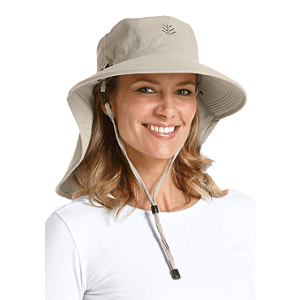 After research into what makes a sun hat great, SimplySunSafe recommends the Camo Coll Outdoor Boonie Sun Hat as the best hat for sun protection for women. 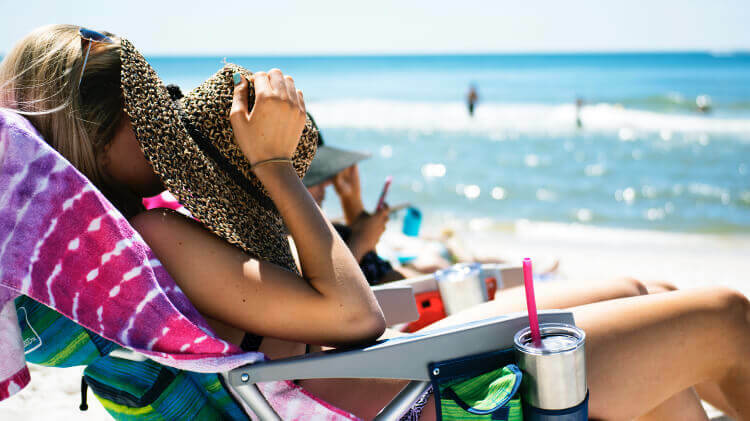 Read on for a our in-depth buyer’s guide, comparison table, and reviews of the top 5 best sun protection hats for women. Let’s start looking at the fun stuff. The features that you want to look for when you are purchasing your new hat. Wide-Brimmed – holidaying, gardening, and laying in my hammock reading a book. These are some of the activities you can catch me doing in these guys. Their wide brim provides plenty of shade. They have such a relaxed vibe about them that I automatically think of honeymooners when I see these. Commonly found in straw and felt fabric options. Bucket – the name says it all. A deep crown and a wide, downward slanted brim are the recognisable characteristics. Can be found in lightweight or heavy fabrics, as well as easy packable options for the adventurers among us. Legionnaire – I hear you, ‘Umm, these aren’t fashionable?’ Why would you even recommend these? Well no they might not be, but I recommend these because sometimes it is much more important to ensure that your entire head is thoroughly protected from the sun’s harsh elements than looking like we just stepped out of Vogue. I tend to wear these when I know I am going to be in the sun for a long time, which usually means I will be sweating (a lot) or when reapplying sunscreen may be a bit of a challenge… like when rock climbing. Baseball – Ladies… if you have read my other articles you know my stance on these. Not enough protection for your entire head so there won’t be any of these recommended. Check out Consumer Reports findings when they undertook some testing on UPF rated clothing to see how it works. As previously mentioned, wet clothing, including hats, may reduce the effectiveness of your sun protection. If you are considering jumping into the water for a cool dip or, if you intend on riding some waves, this might be a consideration for you. You probably don’t want to have to hide your credit card statements from your partner and we all want a quality sun hat that doesn’t break the bank. Well ladies, I’ve got you covered, there are lots of high quality and cost-effective options. We know sun protection is important but we also don’t want to look completely unfashionable while doing protecting our skin. I explore both fashionable and some not so ‘fashionable’ options. Whichever way you choose there is nothing unfashionable protecting your skin. To save your hairstyle, ventilation helps keep your head cool. Some hats have ventilation holes and others have mesh sections. Both have the same purpose – allow heat to escape and keep your cool. Some hats may also have inbuilt sweatbands to keep you nice and dry. 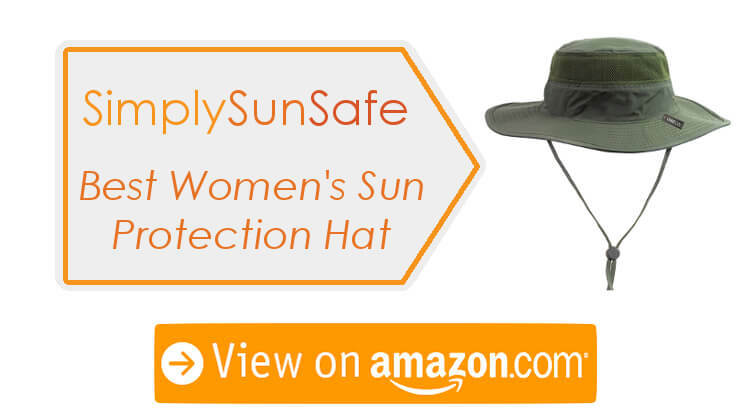 After thorough research that combined discussing issues with customers, reviewing customer feedback, examining manufacturer specifications, participating in safe sun practices forums, SimplySunSafe has chosen the 5 best sun hats for women. These sun hats provide a great UPF rating, are reasonably priced, explore ventilation options, come in different fabrics depending on the activity you want to undertake, and some have fast trying ability for those of you wanting to take a dip. The classic bucket hat. It looks standard, but it is anything but, and that’s why this one came out on top. A rating of UPF 50+ gives you lots of protection. I would buy this hat myself, for my girlfriends and even my mom – I believe in its sun protection abilities that much! The soft polyester makes this hat comfortable for all adventures. It has mesh ventilation to keep you nice and cool and a chin strap to prevent it from blowing off your head mid-hike! One size fits all for this one but there is an adjustable drawstring to help it fit you just right. Color options – there are 13 of them! From red to pink, from grey to khaki. You will find one that you like. However, if you can’t decide on just one, this budget friendly option means that you can buy two, or even three! Just look at this, the classic adventurer style hat. It’s got so many great features I just had to include it in my recommendations. Where do I even begin? 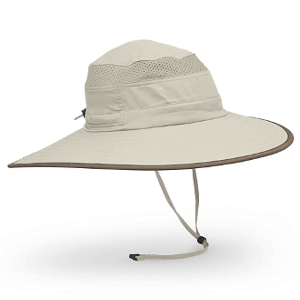 It’s got a wide brim that’s foldable depending on the look you’re going for and provides you with loads of shade and it’s also rated UPF 50+ so you’ve definitely got yourself covered for sun protection! Next up sizing, it’s available in two different sizes plus has an adjustable cord to ensure a snug fit. There’s 2 color options the classic neutral sandstone or if you’re after something a little different the soft pink Passion Flower may be more your style. The polyester fabric makes this hat lightweight and comfortable. The mesh keeps you cool, and the chin strap keeps it securely on your head. This hat is also water repellent so no need to worry about wanting to cool off just jump straight in. It also has an internal secret pocket to stash some lollies, keys or coins. My only negative is that It’s at the higher end of the budget but this is matched to the style, quality and features of this great hat. Get Sunday Afternoons Lotus Hat Now! Look at this one. I love the look and style of this straw hat. These are my absolute favourite style of hat to wear while holidaying and relaxing. I also love how this one has a little bit of a ‘country’ vibe for something a little different. So, down to business, UPF 50+ rating with optimum protection but still manages to be light and breathable. A large brim all the way around for lots of shade. This hat is lined with cotton and has a sweatband to help wick away moisture. If you are heading off on an adventure then the chin strap will help this guy stay put! Available in one size only but available in 2 neutral color options it’s bound to go with all your outfits! The quality of this hat means its price point is a little on the high side, but well worth it. 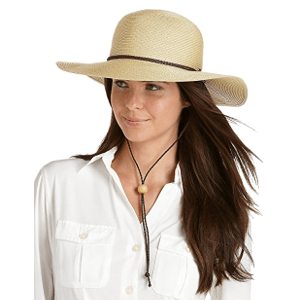 Get Coolibar Smartstraw Sedona Hat Now! Another one of my favourite styles. This time it’s a little bit more budget friendly for you guys. This beauty has a sun protection rating of UPF 50. To make sure you’re comfortable an interior band keeps you dry and a chin lanyard keeps it on your head. Now for sizing it fits small – medium so it might not be suitable for us with bigger heads or loads of hair! It comes in a number of color options and even a ‘floppy’ options for that ‘honeymoon’ vibe. Sloggers is a company that knows sun protection doesn’t have to be unfashionable. The beauty of this one is that it also won’t break your budget. Being fashionable doesn’t mean spending a fortune. 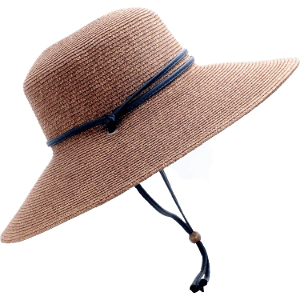 Get Sloggers Braided Sun Hat Now! Not as bad as you thought huh?! This stylish Coolibar hat is a great option for those of us looking for a little extra in our sun protection. The wide front brim provides plenty of shade for your face and ear while the neck flap keeps you covered at the back. This hat is overflowing with features. It’s got a UPF rating of 50+ so you’ll get the maximum protection possible. It is crushable so just fold it up and put it in your backpack when you’re travelling. The back neck flap is also able to be folded and tucked away giving you a totally different look. It also has a chin cord which is removable and a removable ventilated face drape if you need extra protection! This hat is made out of soft and breathable cotton which feels super comfortable on your head. Fancy a swim? It is also quick drying! This is a one size only hat but has an adjustable cord at the crown so it’ll fit you just right. For a little bit of variety there are 3 different color options. This hat is a little high in price but with this many features and a well-respected brand it’s well worth the price if this is your style. Get Coolibar Ultra Sun Hat Now! Well ladies, I wrote this for all the women in the world that wanted to find the best women’s sun protection hats. I am way too familiar with the feeling you can get when you want to make a new purchase but have no idea where to start. Hopefully this article helped you answer some of those questions you may have had! You may also want to test out your sun protection knowledge, if this is the case check out the Canadian Cancer Society’s quiz to test out your knowledge. 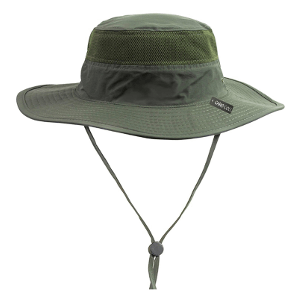 SimplySunSafe recommends the Camo Coll Outdoor Boonie Sun Hat as the best hat for sun protection for ladies. After thoroughly researching the best women’s hats for sun protection this was my favorite. The features of this hat were outstanding and the price point meant that it really is the best pick. However, if you prefer one of the other styles pick them, or pick more than one! I always like to remind you that a hat is not your only weapon against the sun’s harsh rays. It might begin with a fabulous hat but it definitely does not end there. Sunscreen, sunglasses, clothing and hats together provide you with the best sun protection when outdoors. The American Cancer Society have some great additional information on how to protect yourself from UV rays if you need a quick refresher! I love hearing from my readers, so if this article encouraged you to make a purchase, or if you found another hat you simply had to buy that didn’t make this list please let me know about it in the comments. I love updating my guides and undertaking research to ensure I have provided my amazing readers with the best information possible.